Our aim is to foster and encourage all our members to take an active interest and, also, to participate in sporting events. 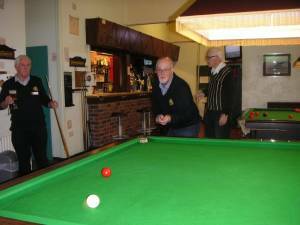 Maintaining fellowship and co-operation with other clubs by participating in the scheduled Rotary Sports events within a friendly competitive manner. Takes place from September/October onwards and involves 4/5 players with the total highest score being the winners. Takes place from October onwards and includes, Snooker, Darts, Carpet bowls and involves 6 players, 2 singles and 2 doubles with the highest total number of games being the winners. Takes place from November onwards and involves 6 players, 2 singles and 2 doubles with the highest total number of games being the winners. Takes place from April onwards and involves 6 players 2 singles and 2 doubles with the highest total number of games being the winners. • District Quiz We will endeavour to enter a TEAM in the District Quiz each year.